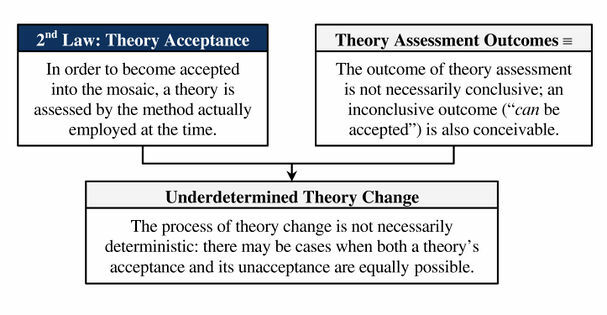 An attempt to answer the question of Determinism vs. Underdeterminism in Scientific Change which states "The process of theory change is not necessarily deterministic: there may be cases when both a theory's acceptance and its unacceptance are equally possible." Underdetermined Theory Change theorum was formulated by Hakob Barseghyan in 2015.1 It is currently accepted by Scientonomy community as the best available theory on the subject. Underdetermined Theory Change theorem (Barseghyan-2015) is an attempt to answer the following question: Is the process of scientific change a strictly deterministic process? Will two unconnected communities experience a similar historical series of changes in their individual mosaics? See Determinism vs. Underdeterminism in Scientific Change for more details. This page was last modified on 28 September 2016, at 14:40.